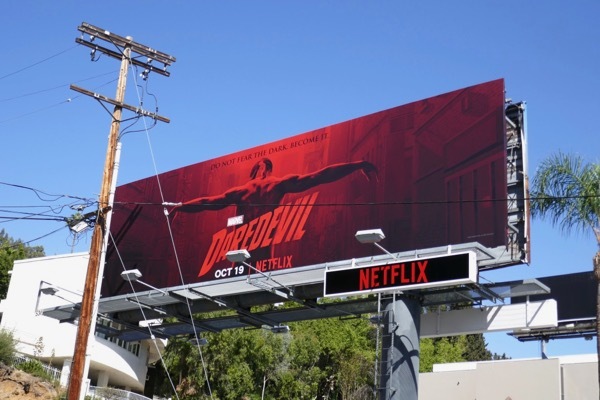 Charlie Cox's 'Matt Murdock' returns to patrol the gritty streets of Hell's Kitchen in the second season of Marvel's Daredevil series on Netflix. 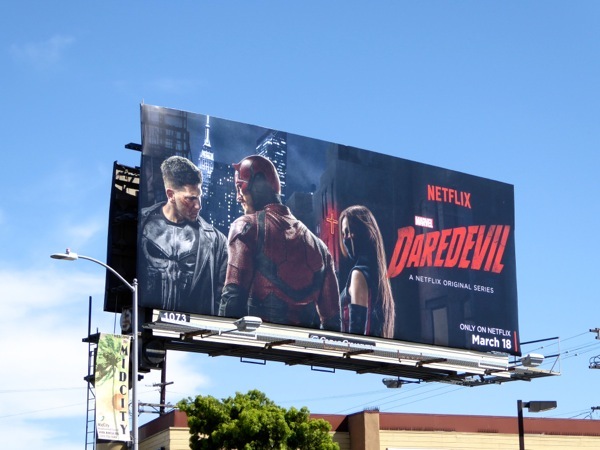 This time joining the line-up of people wanting to beat him to a bloody pulp are fan-favourites, the skull-wearing vigilante 'Punisher' played by The Walking Dead's Jon Bernthal and horn-head's old assassin girlfriend, 'Elektra' (Élodie Yung). 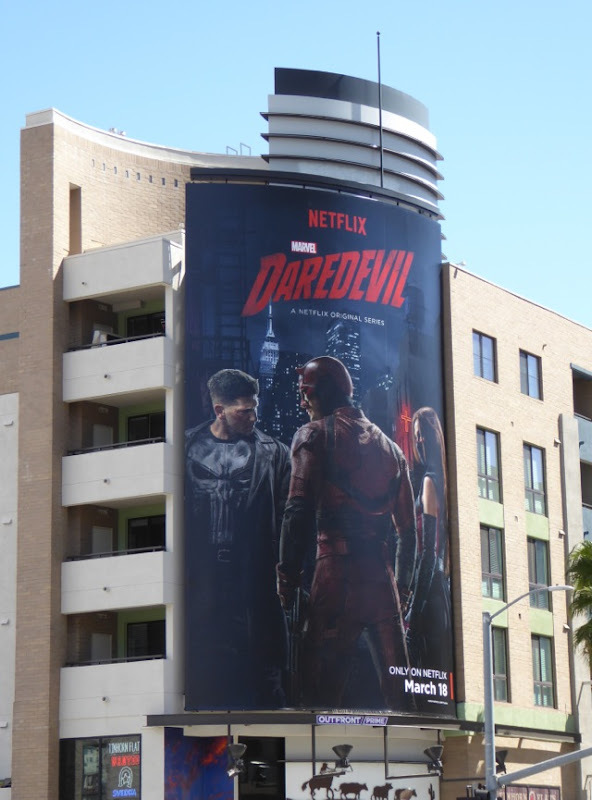 With his guns blazing and singular vision, 'Frank Castle' aka the Punisher, fits well into the brutal street-level heroics of Daredevil's world (even if he first made his debut within the comic book pages of The Amazing Spider-man #129 in 1974). 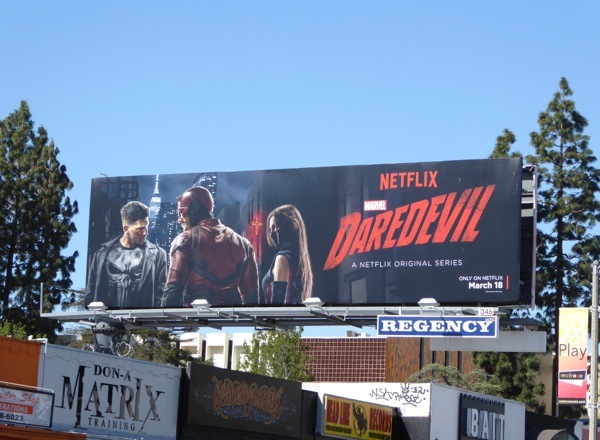 Can the blind lawyer continue his brand of vigilante justice at night and protect innocents in the courtroom by day (with the help of 'Foggy Nelson' and 'Karen Page') with these new antiheroes to deal with. 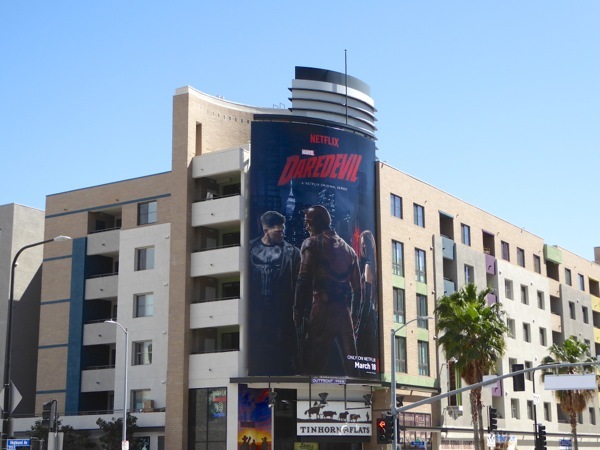 Will they be his friends or foes? 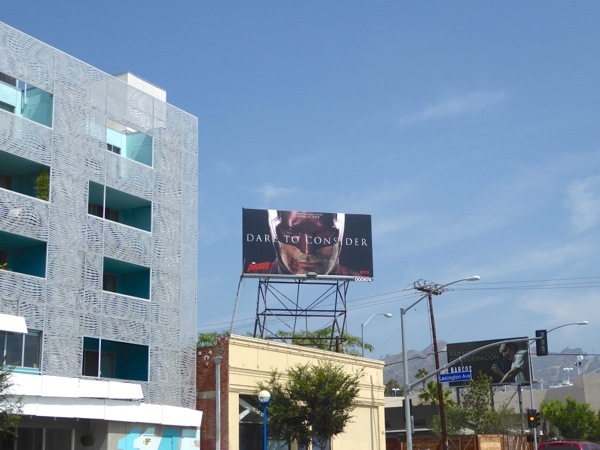 These sophomore season billboards were first spied along Highland Avenue on March 18, then later along Pico Boulevard and Melrose Avenue through March 31, 2016. 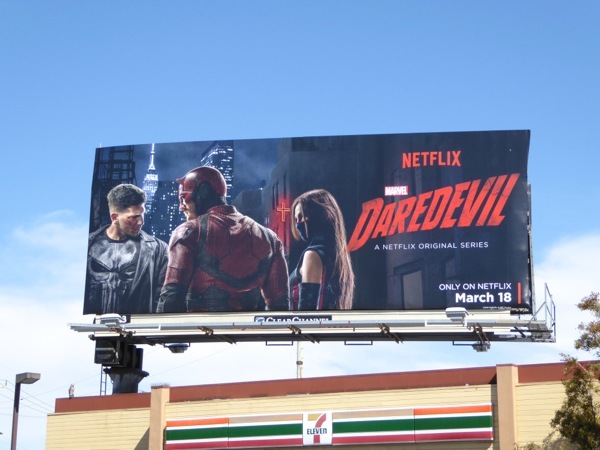 If you're a fan of 'The Man Without Fear', be sure to also check out this season one Daredevil billboard and for another Marvel Netflix show, take a look at these Jessica Jones billboards. 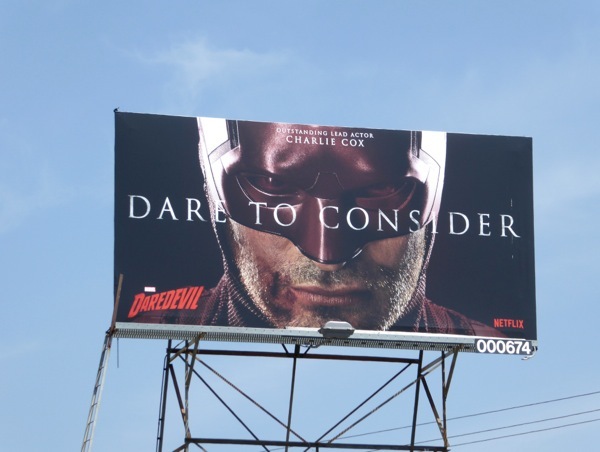 Some comic book movie adaptations have lost their way when they add too many characters, heroes and villains, so only time will tell whether three's a crowd for Daredevil. What does your radar sense tell you? 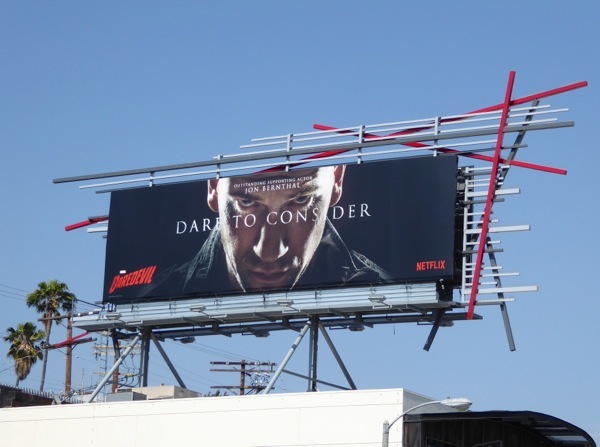 UPDATED: Jon Bernthal so impressed in his performance as Punisher in the second season of Daredevil that it earned him his own spin-off Netflix series. 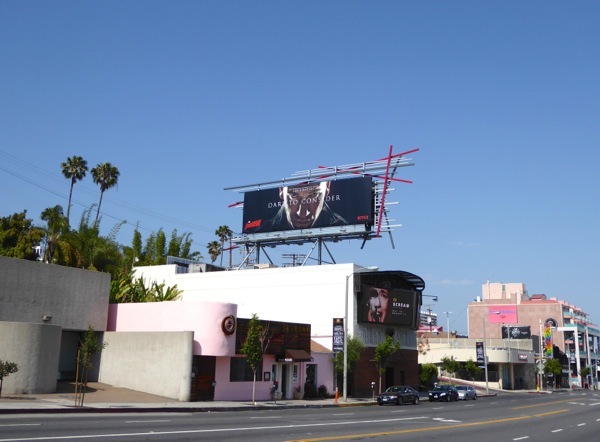 Now will he be able to win over Emmy voters and garner a nomination with this arresting 'Dare to consider' billboard along West Hollywood's Sunset Strip on May 30, 2016. 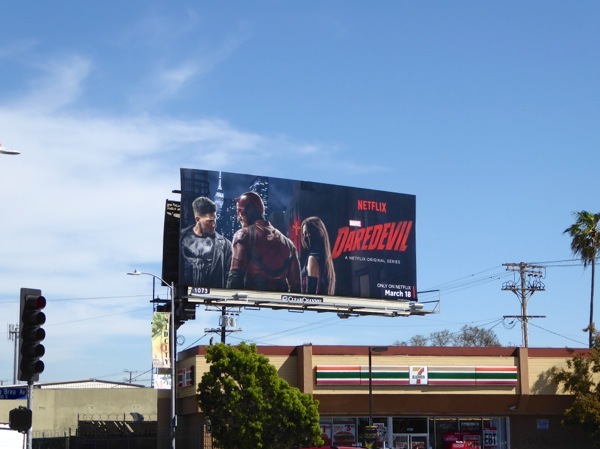 In addition here's a smaller ad for the Man without Fear himself, Charlie Cox, looking brooding under that red mask in the skies of La Brea Avenue on June 2, 2016. 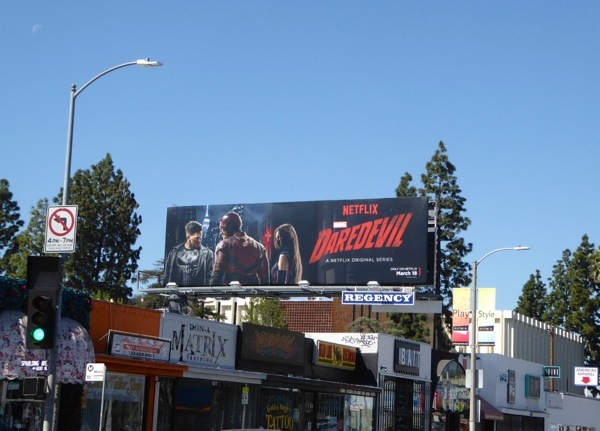 UPDATED: And after the events of The Defenders, here's the season three billboard for Daredevil spotted along the Sunset Strip on October 12, 2018.